Bathroom or no bathroom, that is the question..
Hi, I have almost sold myself on a 13' scamp that I will use for sales trips around new England. I love the idea of a bathroom but don't like the thought of the smell or loss of space. If you have a scamp with a bathroom are you happy you have it or would you have liked the extra space instead? I would love any advice. Our bathroom smells no more than any bathroom might on occassion. I would not trade the bathroom for space. Don't have a Scamp but would NEVER consider not having a bathroom. We have no odor and our "bacon" has been saved MANY times while on the road and no other facilities anywhere near. However, your choice. Thanks to you both. Bathroom it is. We make do with a porta potti. We have made some emergency stops alongside the road to use it. We like the space in our 13'. I don't think I would enjoy doing the black/grey water thing. Of course we empty every morning. This I think eliminates odor problems. I found the holding tank on the PP can get ripe quickly. Can dump in rest stops with bathrooms and have. Our grey water is a 5 gallon bucket which also pours down toilets well. We come from a tenting background and that may have had some effect on our decision. Have had porta-potti in a couple of previous trailers, and would NEVER EVER EVER EVER consider that route again! Emptying it always brought me to the edge of throwing up (psychological I know - and likely more psycho than logical! ) Dump hose is clean, non-smelly, and easy to use, without getting "up close & personal" with contents of P-P.
Hmmmmmm, now that is interesting. Having only camped at maybe a dozen campgrounds total we have never ran into a nasty bathroom. Even Florida's rest stops are sparkling clean. Would love to see a poll as to how often folks run across icky bathrooms? Rarely, Occasionally, never? And in which Regions were you traveling through? And were they Public or Private Camgrounds? State, Forest etc? I'm new here. But I'm going through this same thought process. I want to upgrade from a Little Guy 5 wide teardrop. I'm curious as to what year Scamp started including bathrooms in their 13 footer? I've only looked at two trailers so far, and neither had a bathroom. I camped at a state park after they had turned off their water in the part we had to camp in. I was with a group doing some volunteer work. The outhouses were clean, but a bit ripe and needed to be pumped out. Oh how I wished for a trailer big enough for porta potty or bathroom! The entire reason (well, mostly, or at least it's a good story) for me switching from tent camping to a trailer was the desire for a bathroom. All started on a trip in 2004 where my wife & I walked to the bathroom at 2:00AM in a 500+ site campground. On the way back we noticed that we were walking a lot longer than on the way. Yup, we were lost. Took 1/2 an hour to find our tent & right then the decision was made. Seriously, I'm sure I could live without a bathroom, but I really don't want to. We have not had a fiberglass rv but we have had 3 pop-ups, 2 with portable toilet and 1 with cassette portable, a TT, a 5th, and 2 motorhomes with black water tanks (keep in mind they are plastic holds odors). I do not like the black water tank which isn't news to everyone here. The only way to keep the smell down is to use a formaldehyde-based product and that chemical gives me a headache and makes me dizzy. We probably tried every product on the market and every tip in the world. Now, it kind of depends on how and where you are going to use the camper. KOA's and Good Sam are usually what we use and they are always clean. Keep in mind that shower in the camper has 6 gallons of water and a weak sprinkler. When we tented, using the campground facilities was so nice - loved that someone did the cleaning and all I had to do was enjoy it! But, it was also heavenly to stop at a rest stop and be able to go in the back, have lunch and use our own facilities at our leisure. Keep in mind that these bathrooms are small so check the measurements. I take it you are familiar with a "wet bath" where it is all one piece. After the shower, you'll be wiping everything down. I actually prefer the "wet bath" to the "dry" bath because everything in the wet bath was met to get wet. I love having a bathroom and hate having a bathroom. Scamp routinely builds and sells both types (bathroom and no-bathroom) even today. Year of make doesn't have much bearing on it. At my age, I find it most helpful to have a bathroom in tow. Or a porta-potti, I suppose... either will work. Of course, the full bathroom allows showers also, and I value that too. I have a Travel John that I've used when tent camping. It has a flap that covers the "business" part, so you can also use it as a seat during the day. Instead of the expensive bags that the company sells, I use medium kitchen garbage bags (doubled) and kitty litter. Some people use peat moss. It's so nice not to have to hike outside in the middle of the night and sit on that cold pit toilet seat, let alone risk being mauled by a bear. In the morning I just put a twist tie on the bag and take it to the garbage. No smell, no water clean-up, easy. 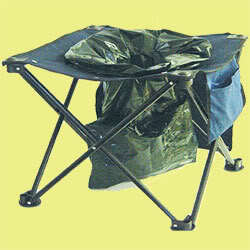 The chair folds up and stores in a pouch just like regular camp chairs. Haven't had the opportunity to use it in the Scamp yet. I bought a little privacy pop-up tent to put it in when warmer camping season rolls around. I'd love to hear people's ideas for showering without a bathroom in their trailer. We have the shower/toilet bath in our Scamp. Really like having the shower more than the toilet (a porta potti would work) can't beat a shower, unless you will be 'camping' or overnighting only in campgrounds with shower houses. As for smell, as Norm or Ginny said, no more than any....there is hardly even any smell emanating from the toilet itself, unless misused. Maintenance & discharging isn't too bad or messy with one. We have a 16' Scamp.